Growing shortages of many types of labor are already starting to have an adverse effect on home building in some parts of the country, according to a recent NAHB survey. The survey consisted of special questions periodically included on the NAHB/Wells Fargo Housing Market Index (HMI) survey, asking single-family builders about shortages of labor in 12 categories: carpenters-rough, carpenters-finished, electricians, excavators, framing crews, roofers, plumbers, bricklayers/masons, painters, weatherization workers, HVAC and building maintenance managers. After an absence of several years, the labor questions returned to the HMI in June 2012 and March 2013. Between June 2012 and March 2013, the share of builders reporting at least some shortage increased in every category of labor. Averaged across all 12 categories, 27.8 percent reported a shortage of directly employed workers in 2013, up from 19.6 percent in 2012. 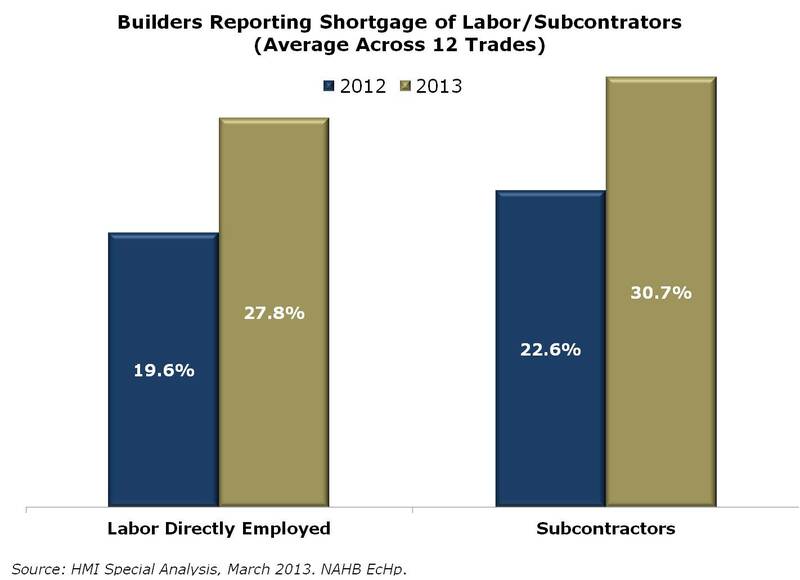 Similarly, 30.7 percent reported a shortage of subcontractors in 2012, up from 22.6 percent in 2012. The rising incidence of labor shortages in NAHB’s survey is consistent with the high number of unfilled positions in the construction industry overall, as reported in the government’s Job Openings and Labor Turnover Survey. A likely reason for the shortages and unfilled openings is that, during the downturn, many workers left the industry, developed new skills, and are not coming back. Other workers may have simply moved away and are not now living in the places where demand for new housing is recovering at the fastest pace. 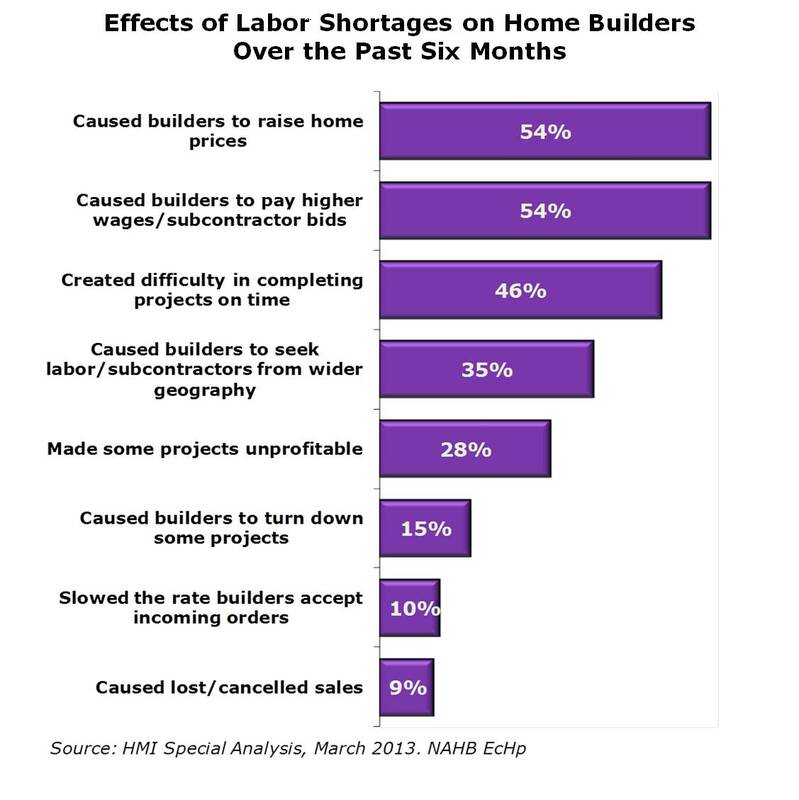 NAHB’s survey also asked builders about the effects labor shortages have had on their businesses. More than half of builders reported that labor shortages over the past six months have caused them to pay higher wages or subcontractor bids, and to raise home prices. Other effects include delays in completing projects on time, builders forced to turn down some projects, lost or cancelled sales. It’s important not to overstate the results. So far, relatively few builders are reporting that the shortages are extremely serious; and, even after the 2012-2013 increases, the share reporting some shortage is not as high as it has been at times in the past when home building was very strong (the complete history of the survey results is available here: HMI March2013SplQ EXTERNAL). But, to put the current numbers in context, remember that the housing recovery is still in its infancy. From 1960-2000, starts averaged over 1.5 million a year and were never under 1 million. Even with substantial improvement in 2012 and further improvement forecast for 2013, NAHB projects that starts will remain under 1 million this year. That would make 2013 the sixth worst year for housing starts since World War II (the five worst being 2008, 2009, 2010, 2011 and 2012). So if some parts of the country are already experiencing a labor shortage, it’s definitely a cause for concern and a potentially serious barrier to further recovery. This article presented originally at NAHB’sEye on Housingblog.